Working out too much or too hard without adequate stretching and resting may cause injuries due to overuse of the muscles—this can throw off your entire fitness regimen. Learn which injuries are the most common and how to avoid them by reading below, so you can continue to exercise safely. Sprained ankle. One of the most common injuries that occur when working out are sprained ankles. While sprains are most frequently endured when running outside on the uneven ground, they can also happen on the treadmill. Losing your focus while running or jogging can result in a misstep that leaves you half on and half off the belt, resulting in stress on the ankle that may cause a strain. You can prevent sprains from occurring by choosing a relatively smooth path devoid of potholes outside and being mindful while running inside. Shin splints. Medial tibia stress syndrome—known commonly as a shin splint—is characterized by pain that runs along the inner edge of your shinbone. This pain is caused by muscle inflammation that most often occurs after increasing the intensity or frequency of your workouts, and by wearing improper footwear while running or playing sports. To avoid this pain, wear supportive shoes, and if you are planning to increase your workouts, do so slowly. Also, warming up before beginning a jog or run can also help prevent shin splints and get your blood moving. Lower back strains. Sudden sharp pain in the lower back when working out may mean that you’ve caused a strain. Performing squats and deadlifts without using the proper form, or trying to lift too much too fast, can not only cause stains but pinched nerves and herniated discs. Avoid these injuries by ensuring you are using proper form when exercising, and not rushing into adding more weight. Check with a personal trainer if you are unsure about your form. Rotator cuff injury. If you experience pain in the shoulder when you reach back, overhead, or to the side, it may mean that you’ve strained your rotator cuff. These strains often occur due to repetitive overhead motion that is characteristic of activities like swimming, throwing a ball, or military presses. 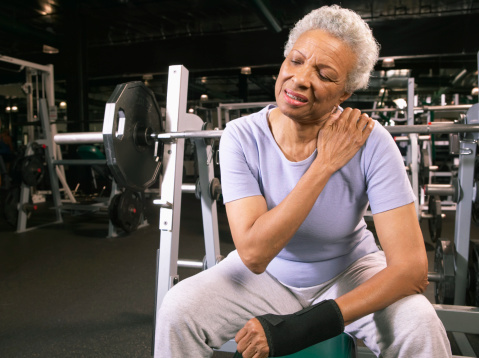 Prevent pain in the rotator cuff by strengthening your shoulder muscles, having good posture, and avoiding repetitive overhead exercises, especially ones with weights that are too heavy. Stress fractures. Working out too hard, too quickly can cause tiny hairline fractures that most commonly occur in the feet, heels, and shins. Symptoms of stress fractures include pain and swelling around the site that worsens with movement. These fractures may also be caused by repetitive jumping, basketball, tennis, and osteoporosis. If left untreated, stress fractures can develop into long-lasting chronic pain, so it is important to see a doctor if you believe you may have one. To avoid stress fractures, start slow and increase workout frequency and intensity gradually. For example, if you jog five miles one week, then you should jog no more than six the next. Exercising regularly is key to maintaining your health, though if done improperly, it can be detrimental. Always warm up before a workout and increase its intensity gradually to ensure you aren’t taking on too much too soon so you can avoid the risk of injury.